The #1 that I thought, through the roof, would’ve been the four parents down at the condo in Florida. That would’ve been unbelievable… I don’t think they ever looked at it. The four parents Jason Alexander is talking about are George’s parents, Frank and Estelle Costanza, and Jerry’s parents, Helen and Morty Seinfeld, who already resided in Florida during the tenure of the series at a really nice residence called Del Boca Vista. At one point, George’s parents decided they also wanted to move to the condominium complex in Florida, and Frank and Estelle decided to stay at Jerry’s during that time to keep a buffer between them and the Costanzas. So, presumably, if George’s parents had ever actually made it to Florida to live in the condo complex, shenanigans would have ensued and everyone would have stepped on everyone else’s toes on a regular basis. 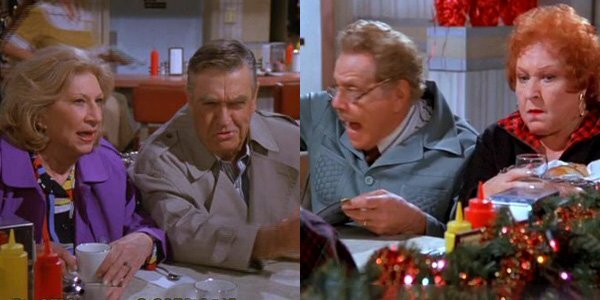 Possibly, the Seinfeld leads would have even popped in for guest starring stints on occasion, which likely would have put the ratings through the roof. But NBC didn’t go for it at the time, choosing new content over a spinoff. Funnily enough, that’s probably not a decision the network would make today. Obviously, as Jason Alexander noted during the Nerdist podcast, NBC never took his feelings regarding the spinoff all that seriously, as nothing ever moved forward related to the four parents concept. He seems pretty gung ho about a Seinfeld spinoff, however, also stating that he would have loved to see Jackie Chiles, a.k.a. the lawyer modeled after Johnnie Cochran who got Kramer a settlement when he spilled hot coffee on himself, get his own series. I’m sure Phil Morris would have loved to see that too, Mr. Alexander. If they had made a legal comedy, with [actor Phil Morris] as the centerpiece, that would be absolute gold. It’s a little too late for this incredible spinoff idea to ever happen at this point. While Estelle Harris, Jerry Stiller and Liz Sheridan are all still kicking, they are getting up in years and probably wouldn’t want to handle the demanding schedule that comes with shooting a network comedy. In addition, Barney Martin, who played Jerry’s fictional dad, passed away in 2005. And Seinfeld has been off the air for so long at this point, I’m not sure the demand for a spinoff or reboot is as big as it might be for other shows, although I suppose I should point out that Full House is also getting a new series, and that show has been off the air even longer than Seinfeld. On the bright side, NBC has some new stuff hitting the schedule at midseason. If you’d like to see what’s coming up, check out our midseason TV premiere schedule.